Recommendations: "La Sagrada Familia" from Gaudí, is so cool and melancholic. It is this giant church in Barcelona. Its creator started on the 19th century and he knew he would die before the construction was finished, for it would take more than 120 years. We are in 2017 and it isn´t finished yet! (but almost). And Book, I will say the Song of Ice and Fire saga, that´s Game of Thrones indeed. Contact/Website: If you enjoyed this interview with Jorge Higginson of Ancestral Dawn and wish to find out more about the band, visit their Facebook profile for further information and current tour dates. As a young musician, I started writing songs about 10 years ago, my early influences (that remain till today) were of course Angra, Iron Maiden and Avantasia, among other power/Heavy metal bands; but also I liked unusual compositions and artists of different genres, I think that´s an important part of searching your own sound. But what made me do Ancestral Dawn (which I started in 2013) was the need of expressing my own voice. When a musician has something to say is when inspiration really starts. The metal scene in Perú at that time also didn´t have a good musical production in terms of arrangements and technical audio engineering (recording/mixing/mastering) so I found Adolfo Gazzo, our musical producer, who has become our partner in crime since then, and together started to work in an album that could reach the standards of an international release. As a teen, as many other musicians of the genre, I had a band that sounded very similar to Iron Maiden. Even our own songs were very similar to some pre-exisiting Maiden songs, so I think is a process of finding yourself that never ends. Ancestral Dawn's Souldance is an album that I consider a second step into searching for our own voice. It has a lot of arrangements with Peruvian instruments that I´ll consider "a seal of the band", it has a way of writing melodies that I also consider different; but it also has a lot experimenting with different styles of metal that are already there. If you take a quick listen to the album, you will notice that each song is from a different "sub-genre" let´s say; so the search for our sound is still on, and I think it will still be. If some tune (or idea) might have similarities with some other stuff, it must be because your went through a similar mental path as other artists, or because it came spontaneously, but not because you thought consciously on copying someone else's work. And if you use someone else's idea, you ask for his permission! It might sound obvious, but trust me, there are looooots of cases of plagiarism on the market. As I told in other answers, the composition "learning" and searching for inspiration and hardworking is a process that never ends. I personally think I´ve grown as a songwriter and composer, cause it's now is easier for me to come up with ideas than in the past. But the challenge is still to create a unique live experience and to develop new music with a style so different, that it really traces a new path in metal. My first really professional studio EVER was horrible, I felt depressed because of a personal issue and I took a lot of time for the recordings! Machines and technology will always be tools for creating. It's not that one is better than the other, technology makes things easier (and cheaper) to develop, it also opens up new possibilities. But without the creativity of man, a hammer will never build anything by itself. I wouldn´t say that it contributes to the compositional process, but to the arrangement and production process, and I won´t say that is a co-authorship. I´m still the kind of guy that writes songs with just a guitar and his voice. Then I use some software to write the parts of the other instrument - but it's just writing down what I already have in mind. When I go to production with Adolfo, modifications, arrangements and editing might appear, but is part of a creative process with him, not with the tools. As I said, the tools might make it easier and comfortable, we might also find new interesting things in the computer, but the final product depends on us. If you give the same tools to other artists, the product will be totally different for sure, and that´s the magic of music and creativity. The instruments are also tools for expressing, but if you give the same guitar to BB King and to Paul Gilbert, different things will come out from each. Is not about the technology, is about what you do with the technology. Collaborations are much better when collaborators know which the concept of the whole piece of music is about, so I really enjoy telling the artists what I´m trying to tell through music.Also jamming is good to connect musically, but in the case of the international guests we worked with them through the Internet, so it was more about the concept. 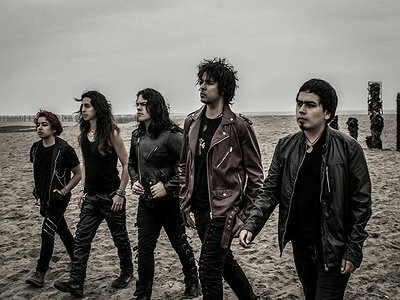 "The challenge is still to create a unique live experience and to develop new music with a style so different, that it really traces a new path in metal."